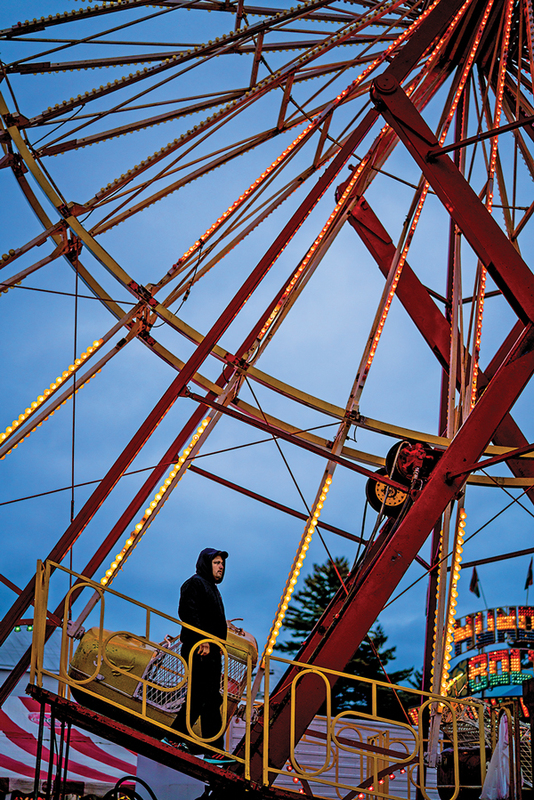 A carnival worker mans the Ferris wheel on the opening night of the Fryeburg Fair. After her husband died in 2013, Jeanette Gilmore took over Smokey’s Greater Shows, an institution on the Maine festival circuit. But in 50+ years of fairgrounds, Ferris wheels, and a fluctuating workforce, life on the midway hasn’t gotten any easier. Welcome to the carnival. 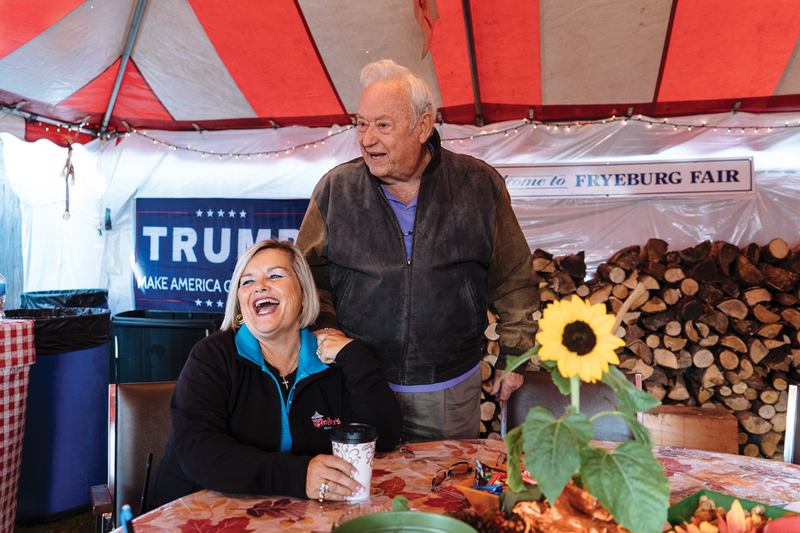 On a sunny Thursday late last September, Jeanette Gilmore’s 40-foot Friendship G7 motorhome sat in the middle of the Fryeburg Fairgrounds, surrounded by the various artifacts of the fall of 2016: cornstalks; big orange pumpkins; a large, red-white-and-blue sign in support of presidential candidate Donald Trump. Jeanette, the owner of Smokey’s Greater Shows carnival company, had been living out of the motorhome since April after driving north from her home in Siesta Key, Florida, to run the business she once co-owned with her late husband, Bud, son of the eponymous Smokey. That afternoon, the G7’s only occupant was Jeanette’s Yorkshire terrier, Buddy. 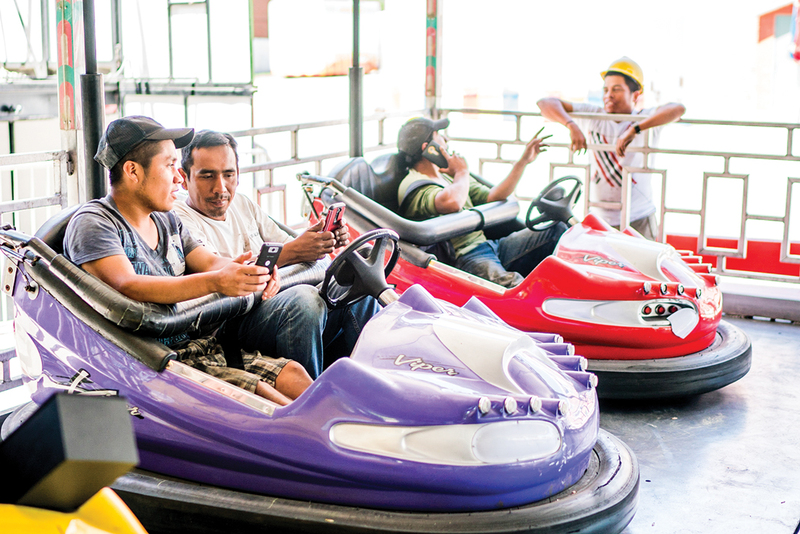 When I asked if they’d seen Jeanette — who they refer to as patrona — the women pointed me towards the fairground office, a short walk through a garden of partially assembled Ferris wheels and Thunder Bolts and Spiders and Sky Divers, all being worked on by teams of men from Tlapacoyan. At the time, the conspicuous Trump sign behind the Tlapacoyan workers seemed counterintuitive, what with 2016 well on its way to becoming “the Year of the Wall,” a year full of campaign rhetoric about “hiring Americans first.” But some three years prior, in a Washington Post article titled “The New Face of the Carny,” Jeanette Gilmore joined several other carnival owners across America proclaiming the necessity of hiring Mexican workers in an industry that has a hard time recruiting Americans. “I put an ad in the newspaper for 40 positions,” Jeanette told the Post in late 2013. “Travel. Work on weekends. Live in a bunkhouse. Last year, I did not get one response. Most I’ve ever had was four.” Though she didn’t comment on how much pay she offered in her ad, the $10/hour that her Mexican employees now earn working for Smokey’s has significantly changed the local economy back in Tlapacoyan. I found Jeanette sitting on a bench outside the fairground offices between Roy Andrews, president of Fryeburg’s 167-year-old fair, and Glenn “Bear” Zaidman, a tattooed and bearded Bridgton selectman, who oversees the fair’s finance committee. At 63, Jeanette stands just over 5 feet, with shoulder-length hair that she wears straight and blonde. That afternoon, she wore a turquoise Smokey’s polo. More often than not, she also wears red lipstick, shimmering eye shadow, dark eyeliner and mascara, a gold cross around her neck, and several gold rings and earrings. Her nails are finely manicured and shiny, and her face can go from distressed to scrutinizing to sincere and maternal, sometimes within the scope of a glance. That afternoon, her face showed little interest in speaking to me. At the time, Jeanette was wary of the media. The year before, Maine newspapers had reported on two accidents that occurred on Smokey’s rides at a carnival in Waterville, and Jeanette felt some of the coverage was needlessly unflattering. The accidents — one the result of a mechanical malfunction on a children’s coaster; the other caused by a rider removing her safety restraint on a swing ride — occurred in the second season since Bud’s death, when Jeanette was still learning to run Smokey’s on her own and feeling vulnerable. 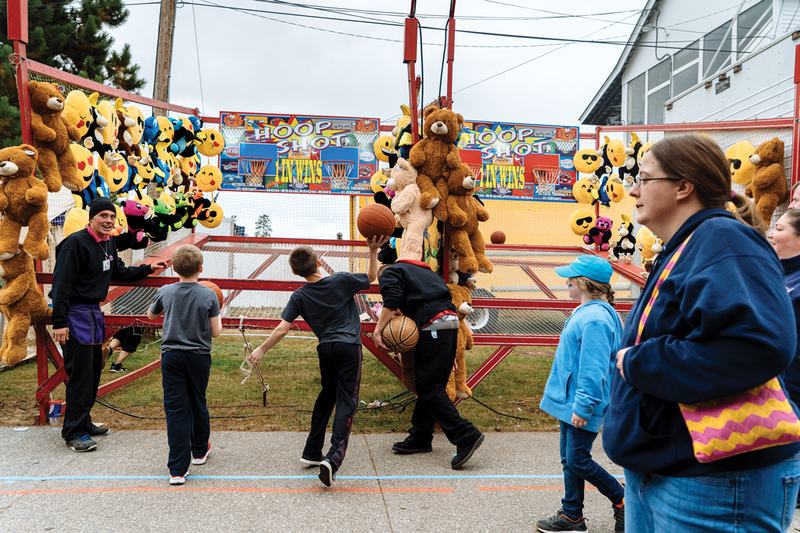 Smokey’s doesn’t own midway games like the basketball toss — only rides and concessions — but independent game vendors can join Smokey’s to share a stretch of midway for all or part of a carnival season. Jeanette sat between the two old friends of Bud’s, and as I introduced myself, they seemed to act as a kind of protective buffer. I was the magazine writer, I said — I’d left a voicemail? Jeanette nodded. Right, she said, her tone noncomittal. The thing was, Smokey’s biggest event of the season started in three days, and she had a lot going on. I could try to catch her during the fair, Jeanette told me, and we could talk more when it was over. We shook hands, and she dissected me with her eyes. The men on either side of her glowered. Jeanette’s path to patrona began with Roland Gilmore, a man she never met, who was born in rural Vermont in 1913 and died 14 years before she married his son. After leaving home as a young teen, Roland earned the nickname “Smokey” for his ability to wiggle free smokes out of a cigarette machine. His son later described him as a hustler throughout most of his adult life, and his carnival empire started with a hot dog stand that he brought around to New England fairs. In 1952, Smokey Gilmore bought a small woodlot in Strong, Maine, which he logged during the winter, and he inherited his first carnival rides around 1960, as payment for a debt. 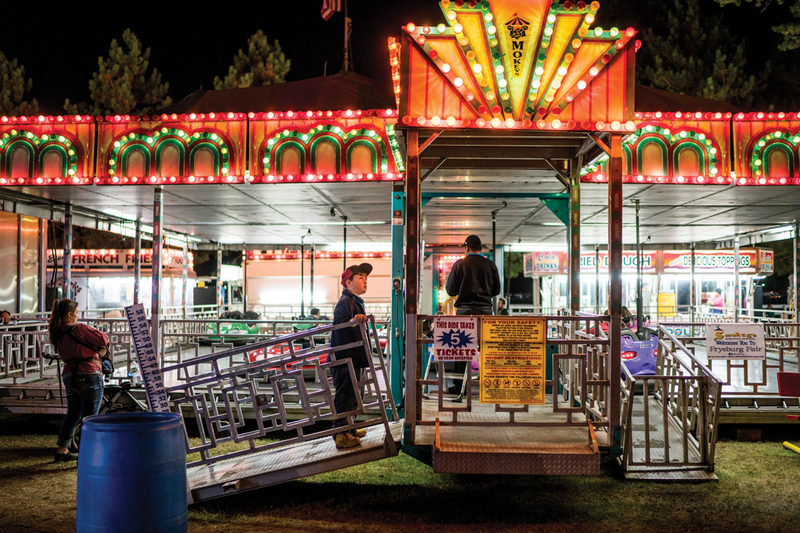 George “Bud” Gilmore, the second of his two sons, joined the family business as a boy, and after a Navy stint and a college degree from UMaine Farmington, he took over the carnival in 1970, following Smokey’s death. Bud was 27 when his dad died, Smokey just 57. Together, Jeanette says, she and Bud watched their industry change, from a loosely regulated affair based on handshakes to an enterprise heavy on contracts, insurance forms, zoning approvals, and other red tape. Bud knew Jeanette tangentially from the New England carnival circuit. She was a self-described “Florida girl” who’d left home at 18 to “go on the road and twirl cotton candy.” By the time Bud approached her at the Litchfield Fair in the early ’80s, asking her out to dinner, Jeanette was 30, divorced, solo parenting a 3-year-old, and working for her father’s ice cream concession. An old friend of the Gilmores told me Bud’s initial attraction to Jeanette had to do with the particular and apparently sensual way she scooped ice cream in her concession booth. They married in 1984 and together raised Jeanette’s son and Bud’s own four children from a previous marriage. 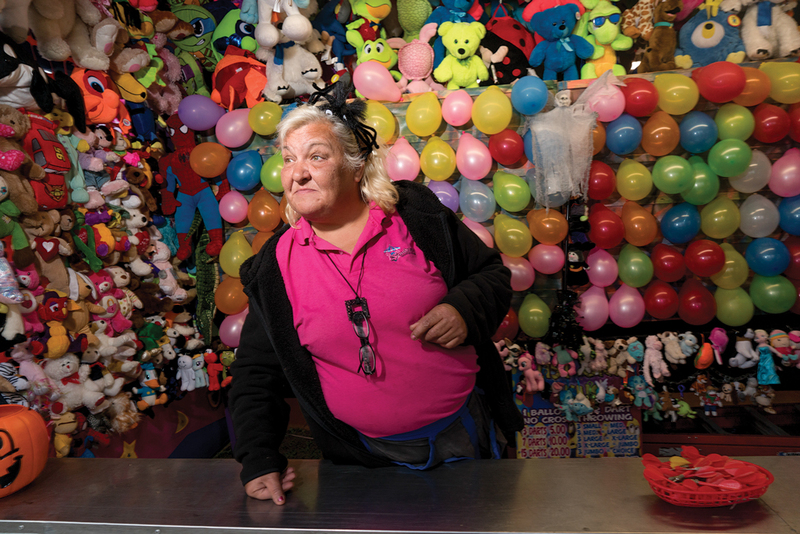 “Right from the beginning,” Jeanette told me, “we were a team.” Together, they spent the three decades managing as many as 50 rides (carousels to Tilt-A-Whirls to Gravitrons) and 15 concession booths (cotton candy to candy apples to fried dough). And together, Jeanette says, they watched their industry change, from a loosely regulated affair based on handshakes to an enterprise heavy on contracts, insurance forms, zoning approvals, and other red tape. In the early 2000s, citing rising fuel costs, the Gilmores scaled back Smokey’s reach, from five northeastern states to just Maine. In 2003, they started participating in the H-2B temporary worker program, hiring their first batch of employees from Tlapacoyan. Then, in November 2013, Bud died at age 70, following a series of complications that arose after a heart valve replacement. In a sense, he died as he lived: on the road, returning to his Florida home after closing out the carnival season, just weeks after celebrating Smokey’s 30th appearance at the Fryeburg Fair. Jeanette laughs with longtime friend Rene Piche in the Fryeburg Fair hospitality tent. 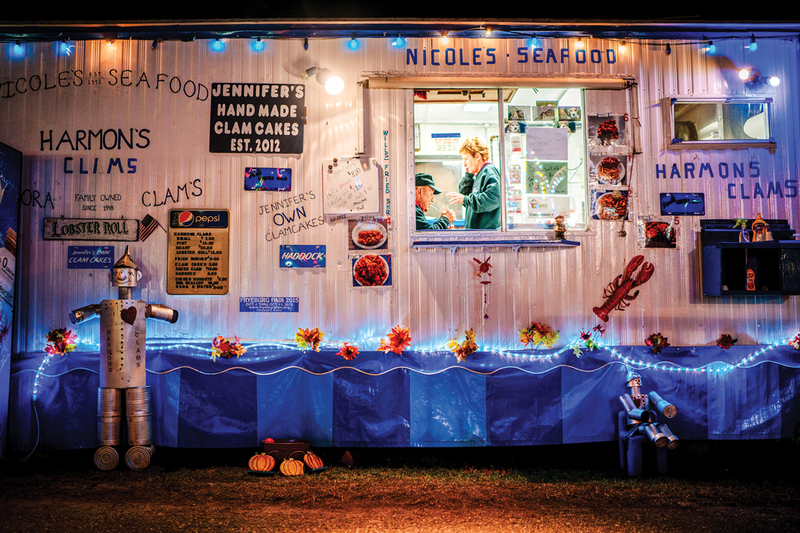 On day five of Fryeburg, I found Jeanette again, sitting inside a hospitality tent, hidden from the fairgrounds by several fence panels, where she and her carnival colleagues gathered each night for dinner. The temporary quarters had all the comforts of home: a roaring woodstove, sunflowers and bowls of candy on the tables, a well-stocked bar, and, on the back wall, hung like a painting, another bright-blue Trump sign. Sitting next to Jeanette was Rene Piche, a food concessionaire and longtime friend of the Gilmores. Over coffee and donuts, Piche reminisced about the nights when he and Bud used to stay up playing cards with their carnival friends. “We used to call ourselves The Rat Pack,” he said wistfully. Then, of course, there’s the stigma, Jeanette offered, the caricature of the gap-toothed, subliterate carny. She sipped her coffee and sighed. “We’ve got teeth,” she said. “Most of our kids, they go to college.” She gestured outside the tent, towards a woman working the games out on the fairgrounds. 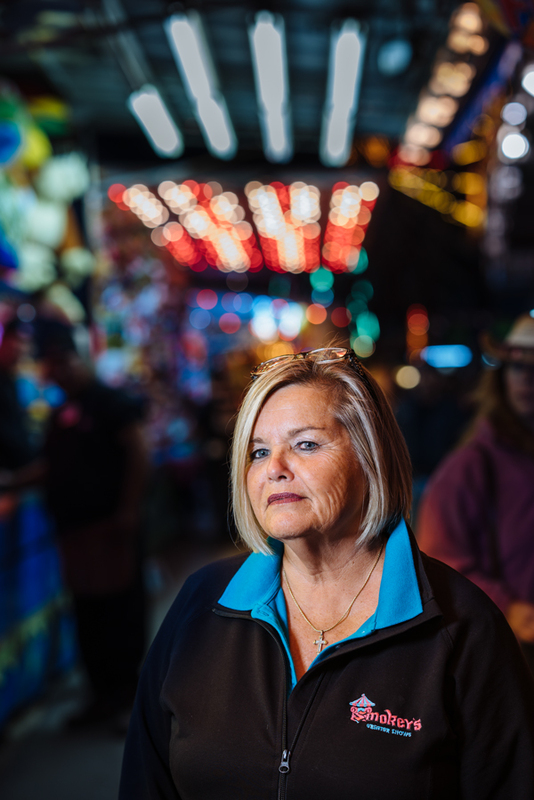 “She’s a real estate agent, but she keeps coming back.” To hear Jeanette tell it, the skills one learns at a carnival apply to other aspects of professional life — chief among them: selling and selling, often for long hours, and never giving up. Since Bud died, Jeanette has been grinding harder than ever. The last few years, she told me, have been full of “so many firsts”: Her first time pulling up to the Gilmore farm in Strong without Bud by her side. Her first time laying out rides without his knowledge to guide her. “I had to ask my boys,” she said, meaning the Tlapacoyan men, “you remember where any of this stuff goes?” Jeanette shook her head. “I used to curse him for all the things we had to do, but I think he knew that one day . . .” She trailed off, then seemed to collect herself. “I think he knew I could do it,” she said, finally. By June, most of Jeanette’s “boys” were back in Maine, and she was back in her motorhome, now parked in a vacant fairground in Topsham, between a demolition derby track and a livestock corral. 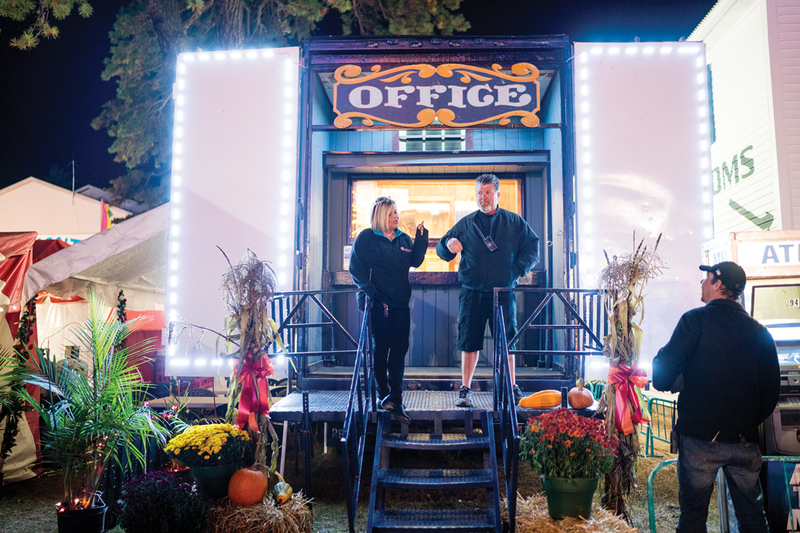 With several southern Maine fairs on the schedule, Smokey’s was using the Topsham site as its temporary headquarters. When I stopped for a visit, Smokey’s was just wrapping a festival in Portland and prepping for a weeklong carnival in Auburn. Outside the G7, Buddy the terrier was bathing in a kiddie pool, occasionally hopping out to play chicken with a group of woodchucks living under a nearby barn. I found Jeanette sitting at a small desk behind the driver’s seat, making calls to Maine’s Washington delegation. She was urging them not to restrict the H-2B visa program, a hot topic this summer, given the Trump administration’s “Hire American” sloganeering and murky stance on foreign worker programs. All of Jeanette’s 55 visa requests had already cleared — she’d started the paperwork nine months prior — but she was concerned about subsequent carnival seasons, not to mention her colleagues in the industry. Already, the bunkhouses behind her trailer housed some 30 Mexican employees, and the patrona hoped the rest would arrive by July. 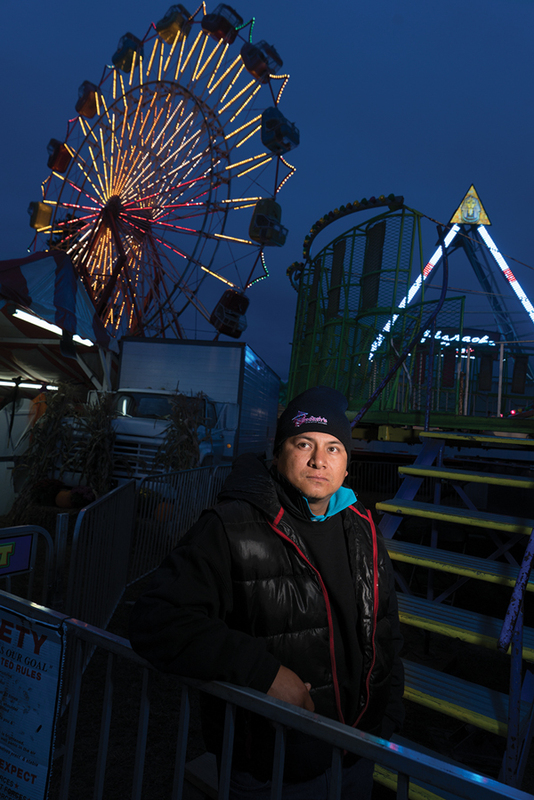 Rafael De La Cruz Dominguez, from Tlapacoyan, in Mexico’s Veracruz state, mans a midway ride in Fryeburg. 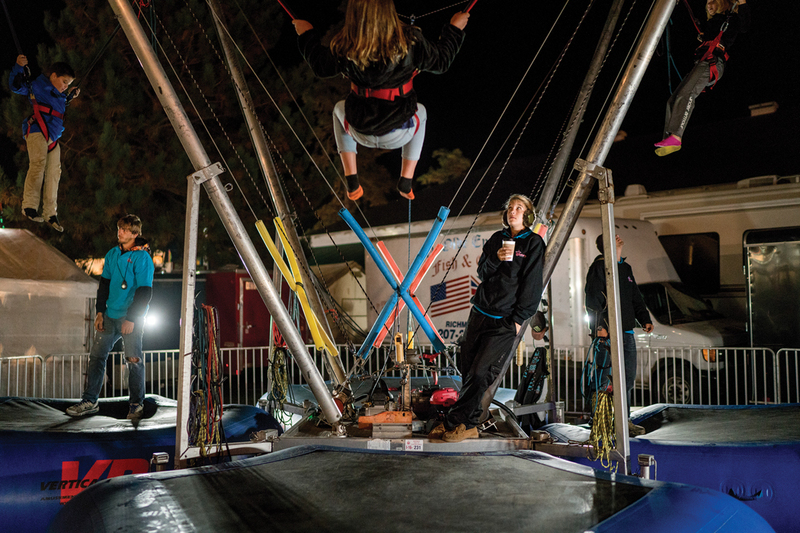 But that morning, Jeanette’s long-term concerns about the visa program were background noise to the day-to-day challenges and financial obligations that attend a traveling carnival show. She needed more LED lights for her Ferris wheel. She had a pair of generators in the shop, both of which were needed in time for a show in Houlton in early July. She was in the process of ordering a new concession stand from Pennsylvania. She had two trailers that needed fixing (failed cooling system, moose collision). She was still reeling from having sunk nearly $25,000 into rebuilding her motorhome’s engine earlier in the year. Around noon, a delivery van pulled up in front of the motorhome and dropped off $800 worth of paint, which Jeanette had ordered at the request of Levit Licona, a 25-year-old from Tlapacoyan in his fifth season working for Smokey’s. When I walked over to see him, Levit was in the process of repairing — grinding, sanding, and repainting — a set of miniature cars hanging from a twirling ride called the Spider. 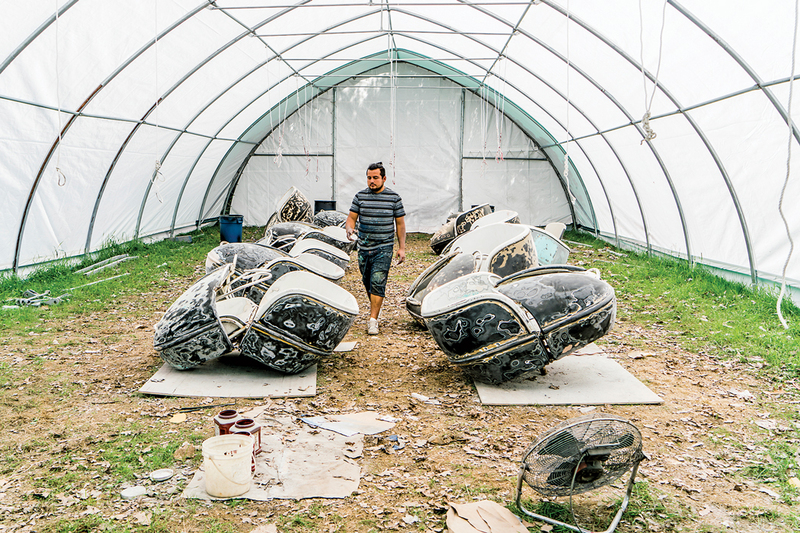 In Mexico, he works in a body shop, doing custom paint jobs. Coming to Maine, Levit and Ana can make as much money in six months as they did back in Tlapacoyan in a year. 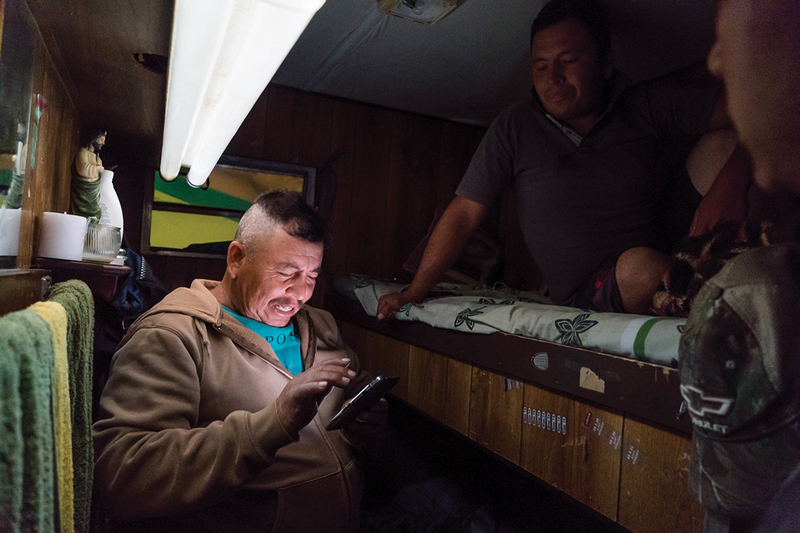 As banda music drifted through the fairground, and as a few of Levit’s compatriots washed their clothes and dishes in outdoor sinks, he showed me the camper he shares with his wife, Ana, who’s also from Tlapacoyan. The couple met five summers ago while working for Smokey’s. While Levit tends to stay back at HQ doing maintenance, Ana works the concessions, selling lemonade or cotton candy. At night, they often pass the time watching movies on Levit’s phone. He likes superhero flicks and Ana does not, although he wondered whether they might find some common ground in Wonder Woman. The couple’s primary nightly ritual is Skyping with their 2-year-old daughter, Zoe, who lives with Ana’s mother during the five months her parents spend working in the U.S.
Ana and Levit invited me to join them for a dinner of Papa John’s pizza, over which they explained the compromises of working so far from Tlapacoyan: Back home, Levit used to work overtime at his body shop to make ends meet, 12 hours a day, six days a week, which rarely left him time to spend with Zoe. 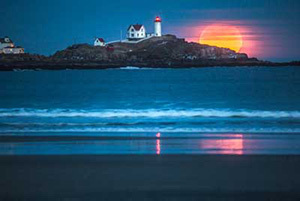 Coming to Maine, he and Ana can make as much money in six months as they did back home in a year, leaving them six months in the off-season to dote upon their daughter. Earlier that evening, they’d gone shopping at a nearby TJ Maxx store, and Ana held up the dress she’d picked out for Zoe — a red-white-and-blue sundress she’d bought for three dollars. Levit shrugged. Being away from Zoe, he acknowledged, was probably harder for Ana than for him. “She is the mother,” he said. Then he wondered whether, by the time they got back to Tlapacoyan in October, the dress might be too small. After dinner, Levit and Ana introduced me to their friend and coworker Berto, who’s worked in the American carnival industry for well over a decade (and who asked me to withhold his surname). He sat in the staff’s shared outdoor kitchen, where he and many of his coworkers eat communal dinners each night. Carnival work is hard, Berto said, and the living isn’t glamorous, but working in the U.S. comes with obvious privileges. In Mexico, Berto said he often has to pay bribes to policemen. Particularly in Veracruz, with its powerful drug-trafficking cartels, tranquility is hard to come by. But that night, he gestured at the tall pines surrounding the fairgrounds, to the pink and purple sunset. 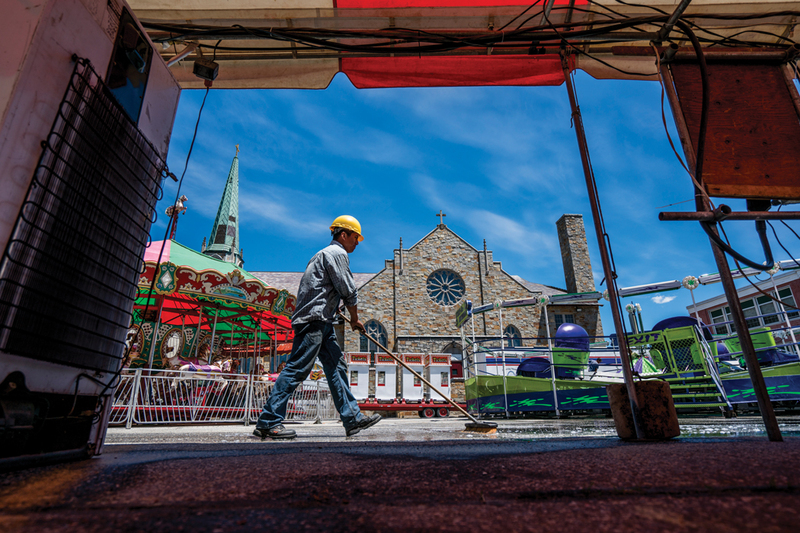 From top: Jeanette, with Smokey’s manager Robby Driskill; Smokey’s workers take a break while setting up for a festival at Brunswick’s Bowdoin College; Anna Kelly of Syracuse, New York, has worked carnivals on and off since she was 19; Levit Licona, of Tlapacoyan, works on ride components in Topsham. “This is very peaceful,” Berto said. Songbirds — veeries, wood thrushes — called out behind him. In his bunkhouse he shares with his son, William (“like Shakespeare,” William introduced himself), Berto showed me photos of his family on a pilgrimage to the Virgen de Guadalupe in Mexico City. He and William tried going to mass at Brunswick’s St. John the Baptist Church for a few Sundays, but they couldn’t understand the sermons. Berto’s proud of Tlapacoyan. On his phone (even as William chastised him for wasting data), he played me a video of a religious parade through the middle of town. Then he clicked over to another video: Tlapacoyan’s mayor, proclaiming on television his commitment to protecting citizens from drug cartels. After it was over, Berto gestured around his quarters, at the bunk bed he shared with William and the room not much wider than he is tall. “Very peaceful,” he said again. I was 5 years old the first time I went to to the St. John’s Bazaar. In high school, I went to watch the local kids fight and ride the zipper with my crush. On Father’s Day weekend, Smokey’s brought their rides to the St. John’s Bazaar, a carnival on the grounds of a Catholic school Brunswick, my hometown. 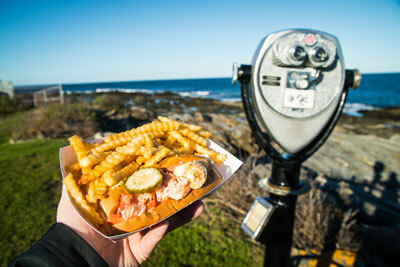 Every Mainer has his or her own localized Smokey’s nostalgia; mine is set at the St. John’s Bazaar. I was 5 years old the first time I went, with my father, who had come from out of town for a visit. In high school, I went to watch the local kids fight and ride the Zipper with my crush. Twenty years later, I returned with my two daughters and noticed that the men who operated the rides weren’t the carnies I remembered — scruffy white men who danced to AC/DC in front of the Gravitron — but instead a quieter group of Spanish-speaking men, considerably more reserved and professional. It was a gloomy day and humid. Come noon, the bazaar crowd was thin. Ana stood in her lemonade stand with another woman, arms crossed, staring at her feet. In the children’s section of the park, where there were no lines, William ran a spinning kiddie ride called Da Bears. Berto manned the carousel’s gate, ushering children the age of his grandkids onto plastic horses. Jeanette had parked her Volvo SUV behind the Thunder Bolt roller coaster and sat inside, talking on her phone. By the time it was dark, things had picked up somewhat: groups of teenagers were doing the Cupid Shuffle and the Electric Slide in front of a stage, and lines had formed for the Thunder Bolt and Gravitron. Some nine hours into her shift, Ana was still on her feet, selling lemonade. William remained at his post at Da Bears. I found Berto gazing up at the Ferris wheel, its neon lights against the dark sky, twirling in front of the steeple of the Catholic church. He held up his phone and snapped a picture, then looked at the image and smiled. Jeanette, meanwhile, was still parked in the same spot, still on the phone, only now she sat in darkness, and when the spinning lights momentarily ignited her windshield, she looked as though she were conversing with some invisible companion. One morning later that week, back at the Topsham fairground, Jeanette sat in the G7, again on her phone, trying to order something called a mulligan wheel from a woman on the other end who didn’t seem to know what it was. From top: A boy waits for his turn to ride Smokey’s Greater Show’s bumper cars on the Fryeburg midway; Samantha Kuhns, of Lewiston, Pennsylvania, watches children bounce on a ride in Fryeburg; Independent concessionaire Paul Blaise lights a cigarette as his wife, Jennifer, walks by; Berto and William, a father and son from Tlapacoyan, share a bunkhouse at Smokey’s temporary HQ in Topsham.  That night, Jeanette was expecting another van of workers from Tlapacoyan, and soon she’d be driving the motorhome 260 miles to a festival in Houlton, while Robby stayed on the midcoast to run the Heritage Days carnival in Bath. All of the Smokey’s infrastructure would have to be divided up: rides, bunkhouses, generators, ticket booths. 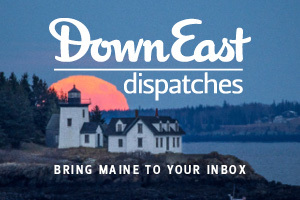 And even as they puzzled through the logistical snarls, Robby brought up another potential crisis: a state budget crisis was hurtling Maine towards its first state government shutdown in 26 years. All of Smokey’s rides require state inspections, and if a budget wasn’t enacted by the end of June, Robby said, there might be no state employees to perform those inspections — and hence, no carnivals over the 4th of July weekend. Jeanette was incredulous — a government shutdown? — but there was no time to dwell on it. She still had a generator to pick up. Moments later came the sound of mariachi horns from Jeanette’s pocket. Her cellphone showed a call from Texas. 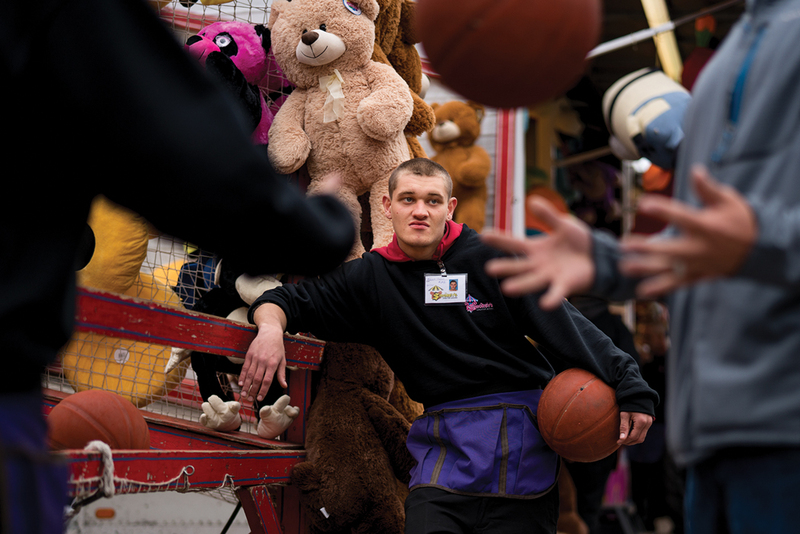 It was a young man looking for carnival work, wondering, if Smokey’s was hiring. “You know we’re in Maine, right?” Jeanette asked him. “Yes, ma’am,” the young man said. He was willing to travel. Jeanette told the Texan she was all set for now, but that he should call back in August, when they were prepping for Fryeburg. Then she hung up. By afternoon, Jeanette still hadn’t found a moment to shower. “Haven’t done anything with my hair,” she told me. “It could probably use an oil change.” With so much going on in the present, it was hard getting her to talk about the future. She’s thought about selling her house in Siesta Key. She’s thought about getting a new truck. Levit recently repaired a dented fender on her old one, a 2005 navy-blue F150. He’d shown me the truck earlier that week, told me he and his coworkers still call it “Bud’s truck” or “patron’s truck.” Inside, I saw Bud’s company ID card still hanging from the rearview mirror. It was sun bleached, the image of Bud’s face almost entirely faded. In 10 years, Jeanette told me, she hoped to still be in the business. But her more immediate hope was that the federal government will “get this visa program straightened out.” In mid-July, the Department of Homeland Security announced it would issue an additional 15,000 temporary foreign worker visas in the second half of 2017, a one-time bump that drew criticism from conservative pundits and seemed to muddy some of the Trump administration’s messaging. The long-term future of the H-2B visa program is still far from certain. “Without my boys, we can’t do anything,” Jeanette says. “We can’t move. I cannot find 50 workers. And the regulations, they just keep coming and coming.” She looked out her motorhome window at her stable of rides, all disassembled for the trip up north. Above her desk, a picture of Bud looked down at her. 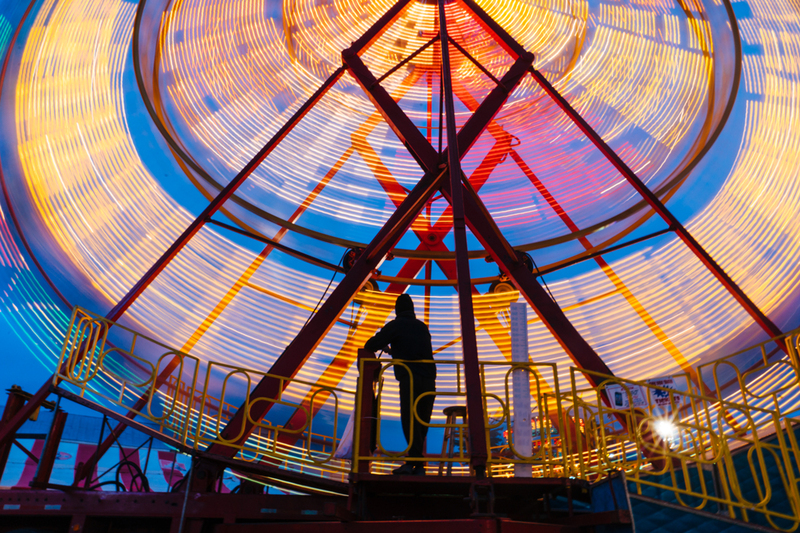 Don’t let the summer come to a close without riding a Smokey’s Greater Shows Ferris wheel at one of the state’s classic late-season agricultural fairs. Listen to photographer Gabe Souza discuss the experience of shooting Smokey’s — and check out some bonus photos — in our online video extra.